Stats Canada states that 23 percent of Canadians aged 15 and older (nearly seven million people) exhibit significant stress on a daily basis, with additional reports indicating that 25 percent of working adults cite stress as the reason for leaving their job. It has gotten to the point that even experts are saying stress has reached epidemic proportions in Canada. Even more concerning, is that many Canadians are turning to bad habits to alleviate (as they see it) stress, including overeating, smoking, alcohol consumption, and drug use. Compound those coping mechanisms with the negative health consequences that already come with stress, including heart disease, stroke, high blood pressure, poor immunity, and circulatory complications, and you most certainly have a major public health hazard to contend with. Options to effectively manage stress vary, but one way some Canadians are seeking a healthy alternative is through a product known as Metagenics Adreset. As a reputable supplier of Metagenics products to the ostomate community, InnerGood is here to share insight into this groundbreaking natural health product to the benefit of all Canadians suffering from symptoms of stress. It’s the physical symptoms of stress that really take their toll on your ability to function optimally on a day to day basis. Weakness and fatigue are two symptoms that can drag you down, and impact you professionally, socially, and at home with the family. Thankfully, Metagenics Adreset has been designed to tackle those two physical symptoms, nipping them in the bud before they can grow to damaging proportions. How does it accomplish this tall task? Keep reading. Why should you care about Cordyceps Mycelium? Cordyceps Mycelium, more commonly referred to as just cordyceps, are derived from the larvae of a species caterpillar and a fungus that grows on it. Got your attention? Before you run for the hills, take note of what it does to combat the key symptoms of stress. Studies show that cordyceps improves physical stamina by enhancing cellular energy in the form of adenosine tri-phosphate (ATP). Further, researchers have found that it potentially works to lower high blood pressure (another damaging symptom of stress) via direct dilatory effects or mediated through M-cholinergic receptors which result in improvement in the coronary and cerebral blood circulation. These recent studies back what ancient Chinese (and other cultures) have known for over a millennia, as the medicinal mushroom has long been applied as a natural remedy for weakness and fatigue in addition to a wide variety of ailments. Metagenics Adreset’s primary ingredient is Cordyceps Mycelium, delivering a whopping 800 mg per serving. You’re certainly more familiar with Asian Ginseng than you are with this Metagenics product’s primary ingredient. However, you may not be aware of how effective Asian Ginseng is in the treatment of stress symptoms. Studies confirm that this highly regarded herbal medicine effectively regulates stress induced immune response and hormonal changes, ultimately maintaining homeostasis in the process. It is reported to suppress the occurrence of anxiety and depression, while also preventing stress-associated physiological diseases. Metagenigs Adreset contains 400 mg of Asian Ginseng per serving. 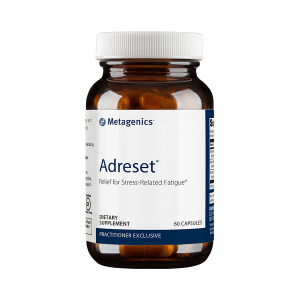 As if the combined efforts of Cordyceps and Asian Ginseng weren’t enough, Adreset also fits in a 100 mg serving of Rhodiola. Rhodiola rosea is a perennial flowering plant (sound more appealing than caterpillar larvae?) that has been used in traditional medicine by primarily Russian and Scandinavian cultures. It has been tasked to combat fatigue, and present day researchers have validated Rhodiola’s role in this capacity, citing within a double blind cross-over study that Rhodiola can reduce general fatigue under certain stressful conditions. Given that when unchecked, exposure to prescription pharmaceuticals as a means to reduce stress can lead to addiction and/or undesirable side effects, shouldn’t Canadians seek out a natural alternative, one with ingredients backed by current research and thousands of years of multicultural applications? Metagenics Adreset may be the answer you’re looking for. View more on this natural health product, and feel free to contact InnerGood with any questions you may have. Cautions: Consult your healthcare practitioner before use. If taking heart medications or have a chronic health condition, please inform your healthcare practitioner. Please keep out of the reach of children.